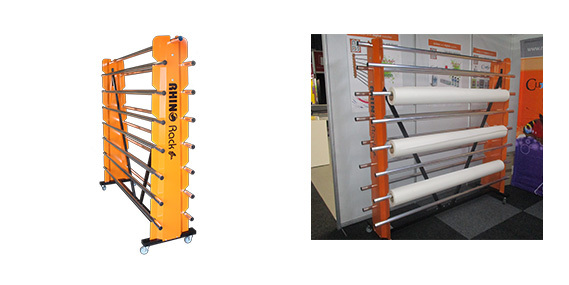 The Rhino Rack is a sturdy media carrier for organising rolls of media in a portable manner. The standard unit accommodates rolls up to 1,6m wide, and holds 15 standard rolls of vinyl, PVC, canvass or any other roll based substrate. Sturdy wheels make moving the unit around within the workspace a breeze, and also allows for media to be stored in a small space for maximum efficiency, as well as preventing damage to media stored on ends or on the floor. The unit can be customised to order, please contact us for pricing. The Media Caddy is a sturdy media carrier for organising rolls of media against the wall in the print room. The standard unit accommodates rolls up to 1,6m wide, and holds 8 standard rolls of vinyl, PVC, canvass or any other roll based substrate. Wall mounted this unit takes up the least amount of space to maximise space efficiency, as well as preventing damage to media stored on ends or on the floor. The unit can be customised to order, please contact us for pricing.